Lyman Hall was the first person from Georgia to attend the Continental Congress. He was sent by his county before the colonial government decided to participate. Lyman Hall was a pastor in Connecticut who decided to study medicine, apparently because his congregation did not like his lifestyle. At the age of 33, he moved with his family to South Carolina. Soon after they, along with a group of people from his new congregation, moved again. This time they went to Georgia, where he would make history. Hall’s medical practice flourished in Georgia and he established a moderately sized plantation. When the American Revolution began, Georgia was predominantly Loyalist. The colony decided not to send anyone to the Continental Congress. Hall’s community of South Carolina expatriates, however, was a small pocket of rebelliousness within Georgia. They decided to send a representative themselves. They chose to send Lyman Hall. When Hall arrived in Philadelphia, the Continental Congress was not sure if they could allow him to sit as a delegate. After a brief debate, Lyman was permitted to act as a full member of the Congress. By the spring of 1776, Hall was joined by two other Georgian representatives: Button Gwinnett and George Walton. When it came time to vote for independence, the men from Georgia were hesitant. Lyman Hall took the lead and convinced his fellow delegates to approve separation. Hall signed the Declaration of Independence, one few doctors to do so. During the Revolutionary War, Hall took the advice of George Washington and moved his family back to Connecticut. This was a wise move, as the British came through town and destroyed his home. After the Americans won the war, Hall was able to move back. Fortunately, he rebuilt his medical practice in Savannah and his family again flourished. In 1783 Hall was elected to a one-year term as Governor of Georgia. This was a time of change, as the war was just coming to an end and a new government was being instituted. Hall worked to revive the economy and build the young State’s infrastructure. Perhaps his most notable achievement was commissioning an institution of higher learning, what we now know as the University of Georgia. During the American Revolution, Lyman Hall played a big role on a small scale. Although he did sign the Declaration of Independence, most of his accomplishments lay in the governing and development of the State of Georgia. For a more full biography on Hall, check out this article from the Society of the Decedents of the Signers of the Declaration. 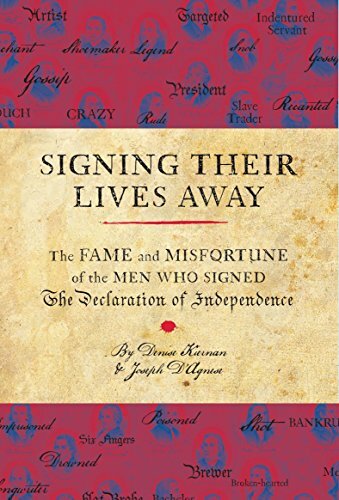 While there is no good, full length bio on Hall, the two books below cover all of the autographs on the Declaration of Independence. 'Signing Their Lives Away' is full of quick, fun tales. 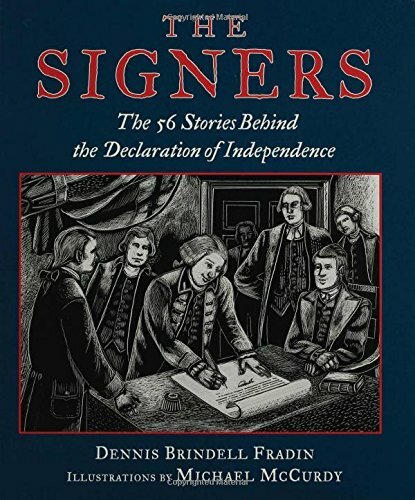 'The Signers' has a lot of illustrations which really help bring these men to life. Don't forget about our Book of the Month either! You can read my full review of 'Plain, Honest Men' here. All the links on this site go to Amazon. We affiliate with them because they offer the best prices and buying through us does not add to your cost.